There has been a distinct shift in the way the world thinks about maritime security and defence. As the world’s political and economic center of gravity has migrated from the Atlantic Ocean to the Pacific, and in particular to the vast arc of trade that moves through the Mediterranean to the Persian Gulf, up into the Indonesian Archipelago and into the South China Sea, it has led to fundamental changes in maritime capabilities worldwide. Over the last 30 year, the defence and security focus is moving away from expensive large, specialized warships to a renewed focus on multi-purpose ships capable of working closer to shore in a variety of roles. A similar evolution is taking place in submarine capabilities, with at least 40 countries (most in the Indo-Pacific region) actively involved in building and operating submarines. At the same time, advances in technology have made submarines faster, quieter and more lethal than at any time in the history of anti-submarine warfare (ASW). In the tight, frequently contested maritime chokepoints through which much of the Western world’s trade (including the bulk of its oil) moves, the diesel submarine is once again rising to prominence as a strategic weapon system, and an essential capability in the modern naval order of battle. Meanwhile, in Canada, a similar shift in focus is taking place. Efforts to protect offshore sovereignty along eastern and western coastlines have now expanded to include the emerging waters along the Arctic coast. As the permanent Arctic ice cover continues to recede, opening the region to wider commercial use and resource exploration and extraction, the world’s attention will undoubtedly begin to focus on the Arctic, and the areas adjacent to Canada’s economic zone in the region. This creates an interesting challenge: How can Canada open the doors to the great economic treasure trove and opportunity in the Arctic, while still preserving its sovereignty and sustain our ability to assert control over this jurisdiction? Given the shift in maritime capabilities worldwide, there is no denying that both the Asia-Pacific region and the Arctic will see extensive submarine activity. As this happens, underwater domain awareness has begun to emerge as a national interest. 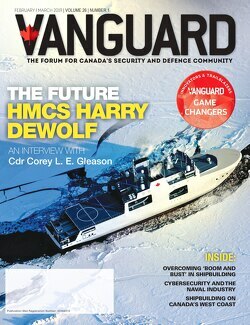 Therefore, the Canadian military must reclaim its reputation for excellence in ASW by leveraging homegrown expertise – Canadian engineers, software design engineers, physicists and academics – to position itself to deal with the new realities of maritime defence and security on all coasts. For more than 40 years, Canadian submarine detection and tracking technology led the world. In the early 1970s, Canada’s maritime role in NATO was focused on providing defence-in-depth, mainly by monitoring and patrolling the Norwegian Sea and the GIUK Gap to defend against a potential outbreak of Soviet navy battle groups and submarines into the North Atlantic. At that time, Canada provided resources for an integrated wide area strategic intelligence and warning system that included ship, shore and space-based assets, which all came together to deliver world-class ASW capability. The ASW role was the operational foundation upon which the Royal Canadian Naval Task Group concept was based. Building upon well-aligned R&D investments, government, industry and the Canadian Forces built and sustained not only cutting-edge equipment, but also placed the navy at the forefront of evolving ASW tactics and procedures within NATO. Canadian innovation supplied advanced ASW technologies to domestic programs under the Tribal Class Update and Modernization Program, the Canadian Patrol Frigate Program, the Submarine Capability Life Extension Program, the Aurora Incremental Modernization Project, and the Maritime Helicopter Project. In many ways, this work institutionalized innovation and collaboration across the navy and enabled Canadian expertise to be developed in acoustic processing and intelligence collection, mission system integration, and in-service support. As a result, many NATO allies turned to Canada for insight and informed opinions on how to move forward with their own ASW programs, which in turn benefitted those Canadian industries supplying the necessary high-technology expertise, and gave Canada a voice in a distinct and challenging defence sector. However, the pendulum continued to shift. In the wake of the Cold War, and particularly post-2001 era, the focus of the Royal Canadian Navy (and navies throughout the world) shifted from open-ocean maritime defence to supporting a more diverse range of maritime security missions. With the diminished threat of major state-on-state conflict, maritime operations have instead been characterized by an intense level of activity throughout the world. Facing a diverse array of surface and shore-based threats, Canada has operated in the Persian Gulf, the Arabian Sea, off the Somali Coast, and in support of the Libyan campaign – all the while continuing to sustain normal NATO operations in the Black Sea and the Mediterranean. Missions have ranged the gamut from UN interdiction and boarding operations, to counter-piracy and counter-narcotics roles, as well as routine maritime search and rescue and defence diplomacy tasks across the world. While these missions have generally followed the migration of the world’s global political and economic centers of gravity eastward, and have made a positive contribution to the global maritime security environment, that focus has gradually eroded ASW competence not only in Canada but worldwide. Within many navies, ASW equipment and competencies alike have been allowed to stagnate, as scarce resources were brought to bear to reinforce or support the evolution of other warfare areas. In parallel, the support for cooperative R&D efforts between industry and government to develop new technologies and approaches to future ASW problems became increasingly limited. Canada’s contribution to the new range of missions highlighted the remarkable adaptability and flexibility that had been designed into fleet with the Halifax-class. But it came at the cost of diminishing capabilities in ASW. Now, with increasing global interest in underwater sensing generally, burgeoning submarine production in the Asia-Pacific, and the emergence of new strategic vulnerabilities centered on global trade in the Western Pacific, Indian, and Arctic oceans, the time has come to recapture Canadian prominence in this vital defence sector. In response to current and expected defence and security realities, the Canadian government has adopted a more aggressive defence procurement strategy that will enable the navy to protect Canadian sovereignty on all coasts. At the same time, the government expects defence procurement to enable economic development, create jobs, and increase exports of Canadian products worldwide. The government’s National Ship Procurement Strategy (NSPS) and the Defence Procurement Strategy (DPS) have created a strategic pivot point for naval recapitalization. The objective is a navy designed to address the needs of the future based on Halifax-Class Modernization, a Joint Support Ship, an Arctic Offshore Patrol Ship, and a Canadian Surface Combatant. To deliver on these programs, the Canadian defense industry and the navy are being asked to focus efforts on areas where Canada is truly the best in the world. Key players in government, industry, and the navy alike recognize that the realities of constrained budgets mean that not all capabilities can (or should) be funded and developed indigenously. For example, reductions to the Science and Technology Program, which originally funded the collaboration that brought government, industry and the military together, will affect completion of some of the tasks intended under the new strategy. Technological change is also a factor, as there has been a shift away from designing and building technology products, to acquisition and development of commercial off-the-shelf (COTS) and military commercial off-the-shelf (MilCOTS) products. Even when there are significant advancements, new technologies can lead to gaps in understanding between suppliers and customers about where technology is headed and what can be accomplished in-house. Nevertheless, with a sharpened focus on areas where Canada can bring world-leading technology and historical experience to bear, much is possible. DPS and NSPS have created an opportunity for Canada’s expertise in ASW to re-emerge and allow Canadian innovation to deliver outstanding, world class capabilities that will, once again, provide Canada with a greater voice in international naval affairs and operations. Canada must seize this opportunity to reclaim its acoustic intelligence capacity, undersea surveillance capabilities, and ASW expertise. In doing so, Canada will be positioning itself as a NATO and defence coalition partner that is strongly committed to anticipating the security challenges of the future. In the Asia-Pacific, the need for advanced underwater sensing and ASW capabilities is only going to increase, mainly among countries that have no history of sub-surface experience. And yet, this difficult battlespace will be where the evolving patterns of global seaborne trade will be determined – a maritime estate of vast importance and surprising vulnerability, and one whose relative security will have a direct impact on our economy. At home, renewing Canada’s ASW expertise will help to deal with the imminent collision of multiple interests in the Arctic. Control of our Arctic maritime estate will be based on how we are able to influence the maritime operations of other nations, as well as a new range of non-state actors, academics, and business groups. All of these entities will be using underwater technology to survey, map, and understand the region. Therefore, the same technologies we use to assert our independence and sovereignty will be in high-demand as we work to determine the resource implications of our vast maritime holdings in the North. Procedural and technological leadership in this area, therefore, furnishes dual benefits: enhancing international and domestic security while giving us commercial and environmental insight into what is going on in our own backyard. The complexity, technology, governance, and security challenges that must be overcome to achieve this level of excellence cannot be addressed by the military alone. The domain no longer belongs solely to our defence groups. A national collaborative approach to underwater domain awareness is needed. To build homegrown Canadian ASW excellence, Canada must find a way to unite its industrial base and move through the projects for recapitalization that will preserve and restore Canadian ASW prowess for the next five generations. United, all players can deliver word leading ASW platforms for Canada, world leading technology for Canadian industry, and a significant return on investment to Canada. As a step toward this goal, General Dynamics Canada has sponsored a new Undersea Warfare EDGE Innovation Centre in Dartmouth, Nova Scotia. This ASW center of excellence is part of the EDGE Innovation Network, and is a place for Canada’s top naval technology suppliers to work cooperatively with academia and government to develop leading-edge, operation-enhancing capabilities for the RCN, Royal Canadian Air Force, Maritime Air and allied naval fleets around the world, as they work to reestablish critical ASW capabilities. The facility will harness expertise and technologies that enhance relationships with Canadian small businesses, expand national supply chains, and position Canadian industry to meet the navy’s needs while promoting a continuous lifecycle of innovation. The immediate focus will be on meeting Canada’s defence and security needs for the Canadian Surface Combatant, as well as across the entire spectrum of undersea warfare, including Canada’s Arctic. • Integrated undersea warfare training systems. Each EDGE member brings unique perspectives and experiences to the partnership, as well as expertise. This combination will bring innovative solutions to market quickly, which can be applied at home and exported to the world. Although an important element of a more collaborative, more coherent way forward for underwater sensing technologies and ASW in Canada, the establishment of the Nova Scotia EDGE facility is really only a first step. As we consider the future of the navy, it’s important to look back at what got us to where we are today. The key to Canada’s unrivalled position in ASW in the past was collaborative Canadian innovation, necessitated by a clear mission and purpose, sustained through stable R&D investment, and shared with defence and security partners around the world. By leveraging that collaborative approach once more, Canada can reclaim its reputation for excellence in underwater sensing and ASW. At the same time, it can deliver the capabilities and capacities that are going to be needed by the Royal Canadian Navy and Canadian Armed Forces as Canada continues to contribute to maritime security and defence in missions both at home and throughout the world. Commodore (Ret’d) Kelly Williams, OMM, MSM, CD, MBA, RCN, is senior director of Strategy and Government Relations for General Dynamics Canada.